You can find the full article in the Rundschau for women 6.2011 , more pants pattern also in our book Metric Patternmaking for Skirts & Trousers. Use a standard pants pattern with darts in size 40 as a foundation. Shorten the length 11 cm and draw the new hemline. Taper the outseam and inseam 1.5 cm at the knee and hemline. Draw the new outseam and inseam up to the crotch line. Measure 5 cm parallel to the outseam at the hem and at the kneeline and draw the stylelines below the kneeline on the front and back pattern. 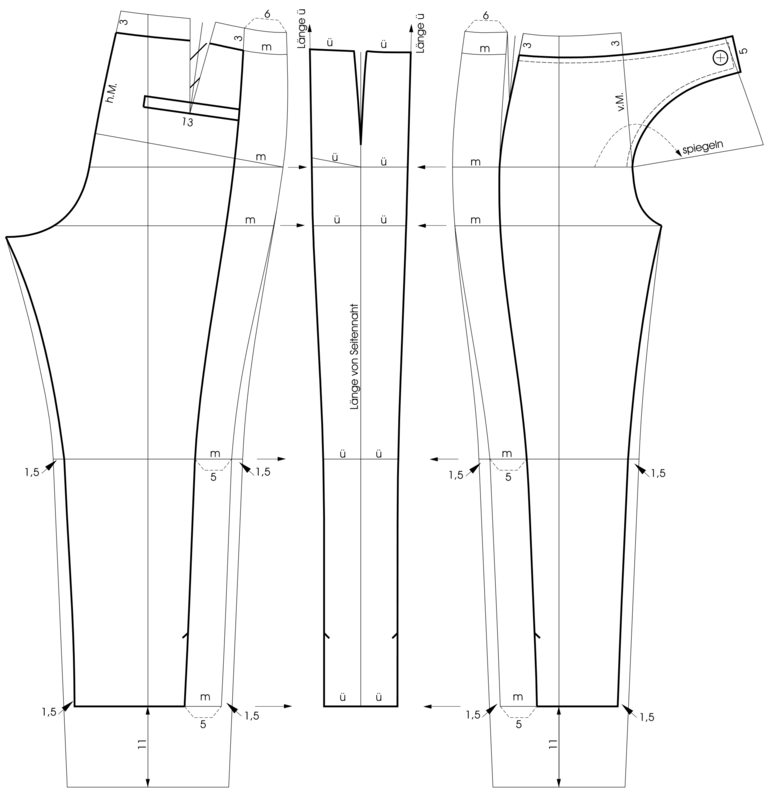 On the front and back waistline, measure 6 cm from the outseam and finish the stylelines as illustrated. The pants are designed without side seams. The side panel has a dart at the waist. First, draw a vertical line with the length of the side seam for the Center of the side panel. Mark the positions of thehorizontal lines at the knee height, the crotch depth as well as the hip depth according to the measurements of the front and back pattern. 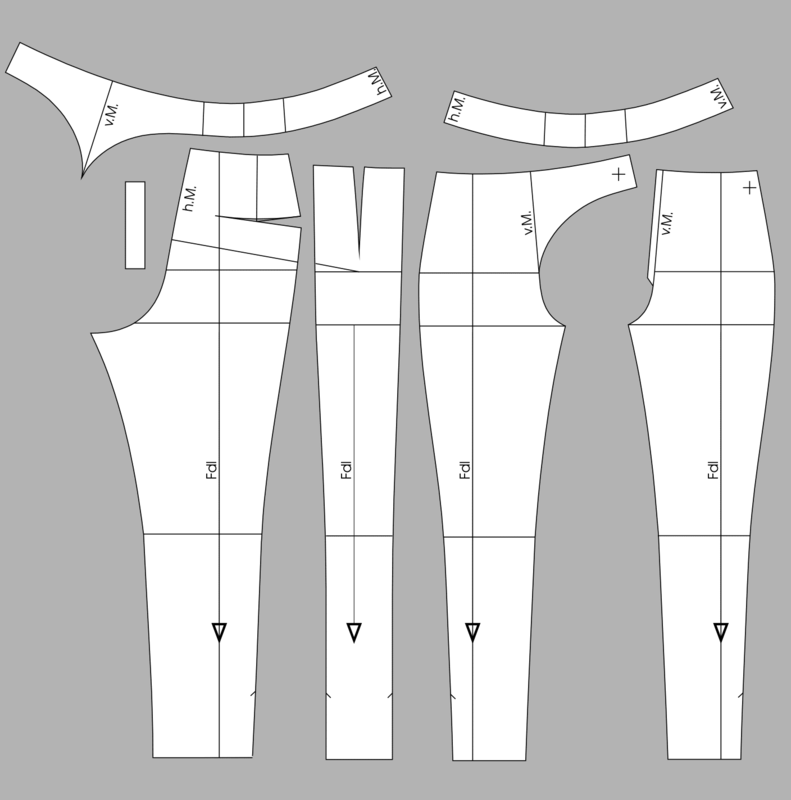 Measure the side panel width at the hem, at the kneeline, at the crotch line and the hipline on the front and back pattern and transfer These measurements to the side panel. Connect the horizontal lines and extend the side panel seams upwards. Mark the width at the waist as on the front and back pattern with each 6 cm and the remove the remaining amount as a dart. Draw the welt pocket on the back pattern. The welt pocket is cut to the side seam. On the finished front pattern, relocate the dart intake to the pocket entry. Mirror the upper front pattern on the centre front and draw the shaped overlap as shown in the illustration. Mark the button position. Finish the pants with contoured facing at the waist and at the overlap. Mark the zipper at the centre front. Separate all pattern pieces. Cut out the front and back pattern up to the relocated side seam. Cut through the back pattern along the pocket opening from the side seam to the dart. Cut out the dart intake and close the back dart. The pocket entry opens as the side dart. Blend the dart line as illustrated. Blend the waistline. Trace a mirrored copy of the front pattern without the overlap. Add 1 cm parallel to the centre front for the relocated front zipper. Copy the contoured facing 4.5 cm wide. Trace the shape of the overlap for the front facing. Join the facing pieces together at the side seam and blend the seam lines. Mirror the facing and lengthen it according to the underlap of the left front pattern. Copy and mirror the pocket welt. Mark the zipper at the centre front. Blend all seam lines. Mark the grainlines.